Macular degeneration is a disease of the retina that affects the macula in the back of the eye. The macula is important for clear central vision, allowing an individual to see fine details. 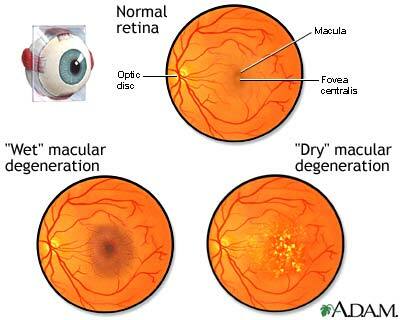 There are two types of macular degeneration, dry and wet. Dry macular degeneration is more common and is characterized by the thinning of the retina and drusen, small yellowish-white deposits that form within the retina. The dry form of macular degeneration is usually mild. Wet macular degeneration can happen more quickly and be more serious. It occurs when vessels under the retinal layer hemorrhage and cause the retinal cells to die creating blind spots or distorted vision in the central vision. The disease becomes increasingly common amongst people in each succeeding decade over 50.